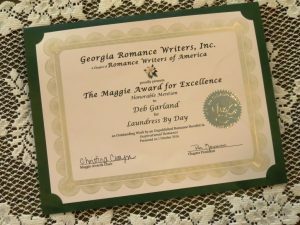 I’m thrilled to receive an Honorable Mention for Laundress by Day in the Georgia Romance Writers’ 2016 Maggie Award for Excellence contest for unpublished manuscripts in Inspirational Romance. Congrats to Inspirational Maggie Awardee – Joanna Davidson Politano for Lady Jayne Disappears. And congrats to my fellow Maggie Awards finalists Michele Morris, Angela Arndt, and Tayna Agler! Thank you to the Maggie Awards judges and staff for this honor! This entry was posted in 2016 Unpublished Maggie Award for Excellence in Inspirational Romance, Awards, Georgia Romance Writers and tagged Georgia Romance Writers, Honorable Mention, Inc., Inspirational Romance, Laundress by Day, NKJV, Philippians 4:13, Romance Writers of America, The Maggie Award for Excellence. Bookmark the permalink.